Tomorrow (Sunday 7th September) is Father’s Day in Australia and I wanted to take the opportunity to tell my Dad how much I truly love and appreciate him. I am incredibly blessed to have such a huge-hearted, giving, intelligent, humorous and generally all-round awesome Dad! In honour of my Dad I wanted to make a card that was a little different from the style of cards I usually make. I have been building up a lovely collection of designs from the Silhouette store to use with my cameo. Despite this collection I rarely use it. The reason for this lack of use is simply that I don’t have room on my table for it so it is a bit awkward to use. 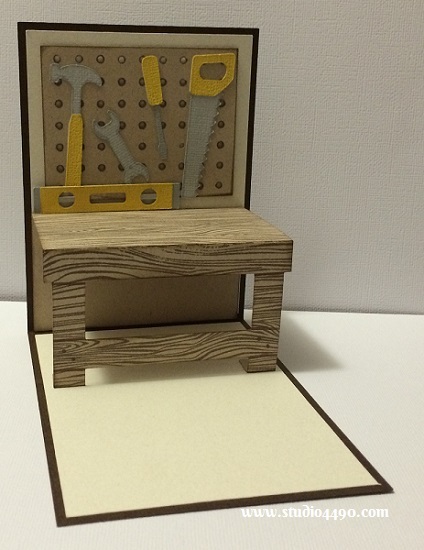 I decided this has to change and when I saw the Workshop Bench pop up card I knew it would make the cutest Father’s Day card. I stayed pretty true to the example used in the store, just because it worked exactly as it was. I did add a bit of wood grain stamping onto the workbench, and added some shading here and there to make it look a little more dimensional, and popped up the cork board and the level on the bench. Loved how it turned out. Materials used: Stamps – Designer Woodgrain (Hero Arts); Cardstock – American Crafts, Doodlebug Design Inc. and Unknown; Die – Workbench Pop Up Card (Silhouette). Loved how simple it was to create and how good it looks. And now I am determined to make more use of my Silhouette Cameo! Well, I’m completely blown away by how ‘Dad-perfect’ your card is! I know he loved it, as do I! Brilliant, clever, masculine, and above all, infused with love! The little level…crushing on that sweet special touch extra! Absolutely fabulous (I’ve only scrolled up to gaze in admiration about 10 times while writing this!). Happy sigh…. Oh. My. Gosh!!!! Your dad is going to absolutely love this card!!!! Brilliant design. Brilliant card. All the little details are there; from the woodgrain bench, to all the little tools with the “right” colored handles. LOVE THIS!!!!!!!! And it’s soooo good to be back blogging again. Was tickled to see that you’d left a comment on my first post back. Now. I do expect to see more amazing cards from you dear girl!!! 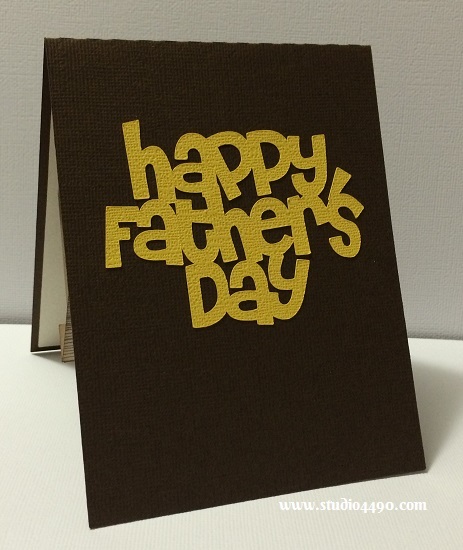 Have a wonderful holiday with your dad, and then get busy creating even more wonders!!! : ) big hugs! HI Bev, so good to see you back! Have missed you. 🙂 Thank you for your kind, uplifting comments. You never cease to make me smile! Dad loved the card. He’s such a dag. He says to me…would you like to have it back to put in your collection? lol No worries, Dad, it’s already on the blog. 😉 I’ll keep creating for as long as I can. 🙂 Now that you are back on deck, I cannot wait to see all the yummy creations you have in store for us too. hugs!! Wow, this is incredibly gorgeous, Kylie!!! It’s so detailed, and absolutely perfect as a masculine card. Definitely fitting a great man like your dad. (Happy Fathers’ Day to him, by the way. I hope he has a wonderful day). Thanks, Elle! Wish I could take full credit for it. lol Silhouette definitely makes card-making easy. 🙂 Thank you for your kind wishes too. He had a lovely day, thank you.